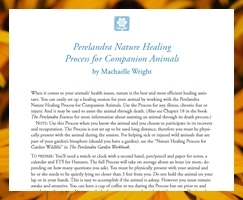 Perelandra Nature Healing Process for Companion Animals - Perelandra Ltd. This is a streamlined, simple process for working with nature to support your companion animals' health. It's for any companion animal, not just dogs and cats. All you need to use this process are the instructions given in the paper and ETS for Humans (for supporting you during the process), nothing else. If you have been using the "Nature Healing Coning for Animals" we highly, enthusiastically recommend you make the upgrade to this new process. Note: For the process needed for helping sick or injured wild animals that are part of your garden's biosphere, see the "Nature Healing Process for Garden Wildlife" in The Perelandra Garden Workbook. 4 cats - 12- & 8-yr old females; 3-mo old kittens adopted in June 2011. The older cats were Humane Society cats "with issues" and the boys brought fleas and rough-house behavior - naturally. The girls had never had fleas and became very allergic to the flea saliva; the 8 yr old was outraged when kittens invaded her home. Her kittens had been taken from her when they were 6 weeks old and she was sent to the Humane Society. Made her head spin. Sometimes the drops just weren't enough and we needed the support of the nature healing conings. Just had one this afternoon for Luz and it's so nice to have her stop hissing and swatting. She ate a bit and is napping. Nothing is "just an animal." We're all special.